BramStoker is a Legacy Library. Legacy libraries are the personal libraries of famous readers, entered by LibraryThing members from the Legacy Libraries group. » Abraham Stoker's legacy profile. BramStoker is also an author. 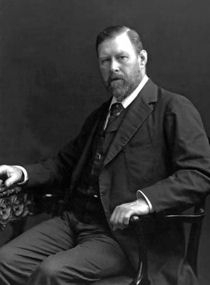 » See Bram Stoker's author page. About meBram Stoker (8 November 1847 – 20 April 1912) was an Irish novelist. During his lifetime he was business manager to the actor Henry Irving and of the London's Lyceum Theatre, but Stoker is best known for his 1897 novel Dracula. About my libraryBram Stoker's library, upon his death, was located at 26 St. George's Square, Pimlico, London. Stoker had interests in both the supernatural and the occult which was reflected in his library with volumes on Egyptology and alchemy. Aside from collections of newspaper cuttings and play-bills, Stoker's library also consisted of armorial bindings of French monarchs from Henri II to Napoleon III, and scores of historical works, including pamphlets about George Washington and Abraham Lincoln. He was also a close friend of the American poet Walt Whitman whose works are present in many rare and autographed copies. Source: After Stoker's death his library was placed on sale under the management of Messrs. Sotheby, Wilkinson & Hodge. The details for his library were reconstructed from the auction catalogue of the sale of his books in July, 1913. The auction consisted of 375 identified works, 184 unidentified volumes, and miscellaneous parcels of books. London, July 7 - The printed books, autograph letters and illuminated and other manuscripts and the library of the late Bram Stoker, who was for years manager for the late Sir Henry Irving, were sold at Sotheby's to-day. the prices were not very high and many articles brought only a few shillings each. The total for the day was only $3,630.